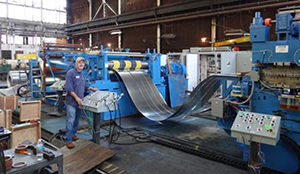 A pull through slitter is used by decoupling or allowing the slitter motor to free spin and slitting material by pulling it through the knives with the recoiler. These are used for heavier gauge material typically 1/4″ (6.35 mm) or above. Due to the heavier gauge material, “coil kinks”, or “coil breaks” could occur. 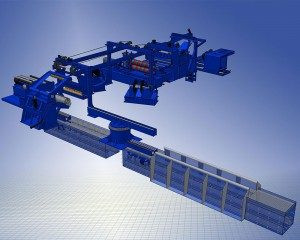 As these are known in the industry where coil set forced into the opposite wound direction causes hairline fracture marks across the strip, a tight line mode of operation has to be met from the uncoiler through the slitter arbors and to the recoiler. Element has supplied pull through slitters that are able to slit multiple cuts of up to 1/2″ thick material. In these machines, all of the power necessary for rewinding and slitting is at the recoiler.